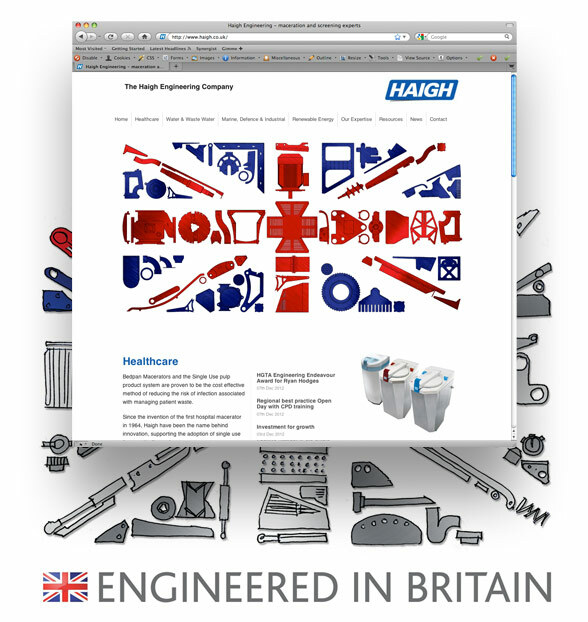 We have worked with Haigh Engineering since 2008 and during this time have concentrated heavily on their brand strategy; helping build their brand in existing and new market areas. With a very clear focus on growth and market diversification, Haigh has a clear appreciation of the significant role that online plays in market penetration and profile, and especially the BI that a well-constructed web strategy can contribute towards sales pipeline development. With an extensive corporate site in place, the challenge was to create a microsite universe which maximised SEO, enabling Haigh to promote their expert status across a range of sectors where their maceration technology was proven; ultimately moving from a product sell to an application sales route. The need for a corporate site was to remain but this needed to be stripped down to act primarily as a navigator towards the microsites. In doing this care needed to be taken to keep hold of the traffic that was using the generic Haigh search term, but to ensure that such traffic was being redirected seamlessly to the most relevant microsite. With a number of microsites already in place, we worked closely with the Haigh divisional teams to map out the priority roll out for new sector sites. Using a multi-site management tool we were able to create a refreshed corporate site which directly linked to each of the microsites allowing for a 2 click user experience and a one-stop content management tool making site management more streamlined for the internal teams. Clear and simple navigation, coupled with relevant content were the driving factors behind each site build. Where appropriate, language variants were made available in order to communicate with the key international markets and ensure that the web investment supported the export and distribution objectives of the business. SEO and Adwords underpin the targeting and effectiveness of the microsite portfolio, whilst regular analytics and benchmarking are in place to monitor trends and review metrics against communications goals.